1. Start tying simple knots at the following measurement points. 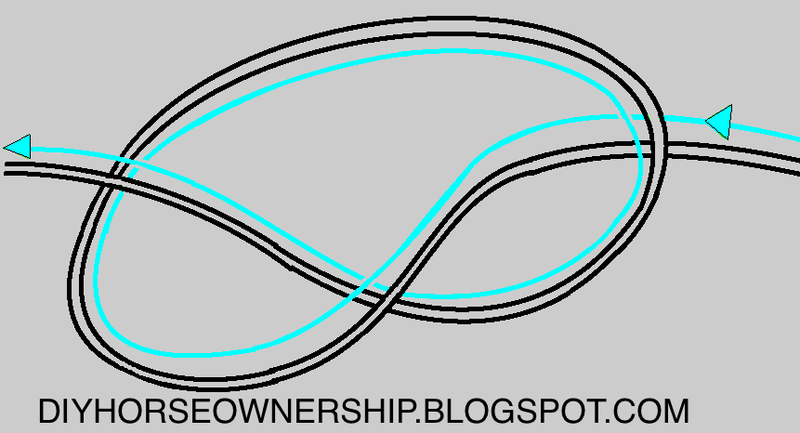 Measurements are from knot to knot and do not include the actual knot. 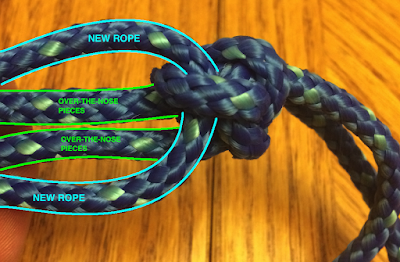 Make sure the knot will stay put, but isn’t too tight as you’ll be coming back to slip the rope through them later. 2. 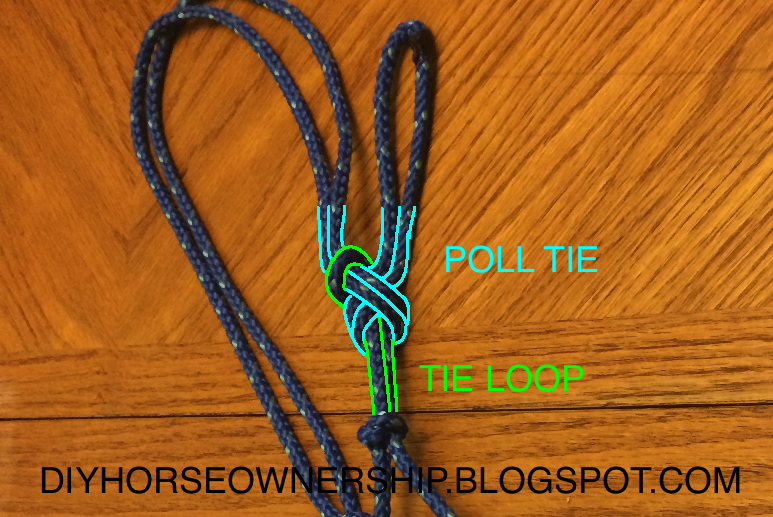 Measure 10″ from your Tie Loop. 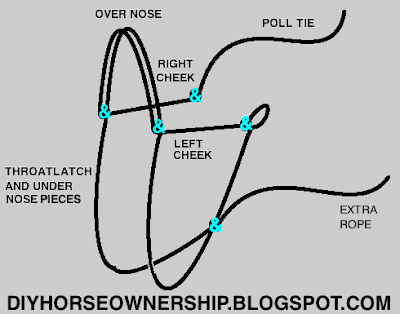 Attach this point to the left nose knot. 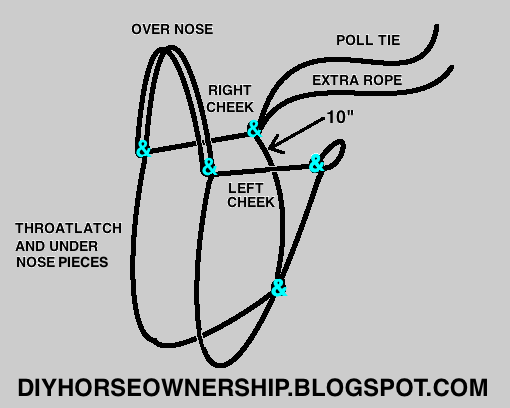 Then go another 10″ and tie into the right nose knot. 3. 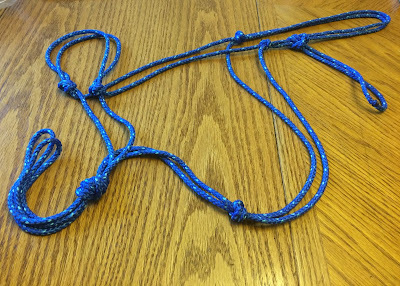 In order to do a tie into a knot, you simply loosen the knot and follow the knotted rope around all the turns with the new rope. 4. After the over the nose piece, things get a little complicated. 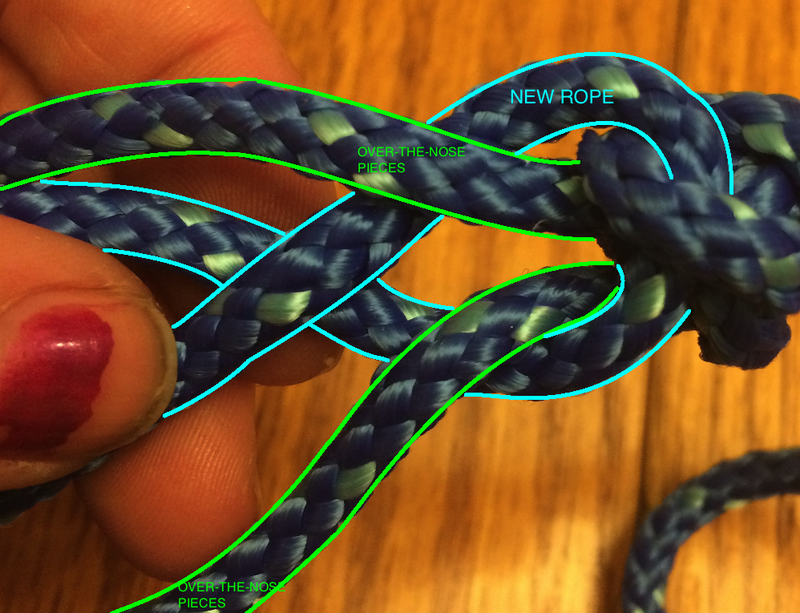 Measure out 30″ more of rope and arrange your ropes in the following pattern so it makes sense. Tie the 30″ into the throat latch knot. 5. Measure 10″ and tie into the right cheek knot. 6. Cut the extra rope to match the length of the poll tie. 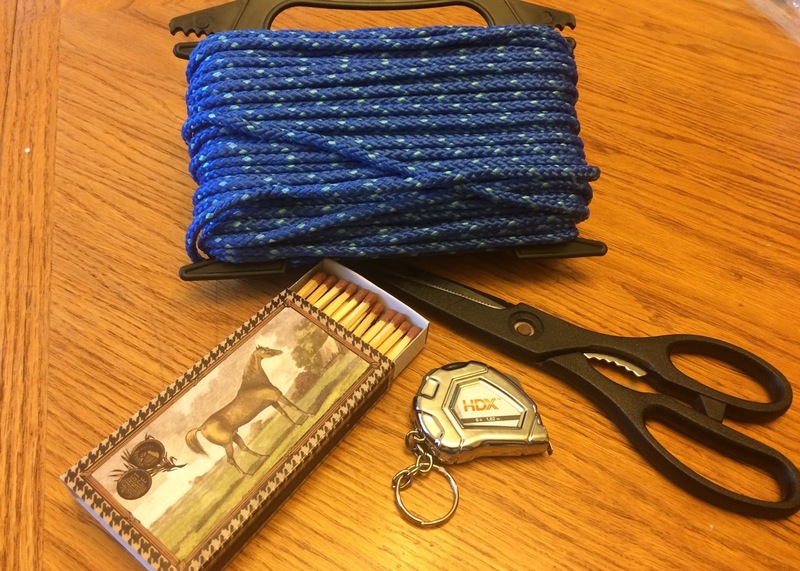 Then use a match to burn your ends. 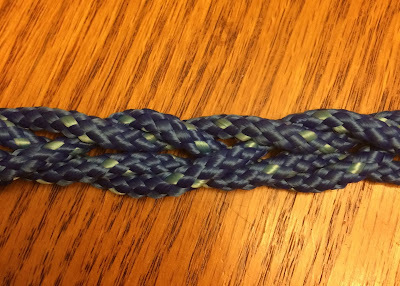 Most rope halters have the two strings separate. 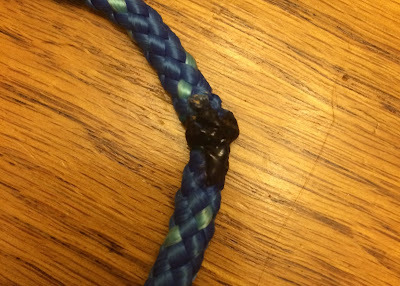 I burnt mine together for convenience. 7. 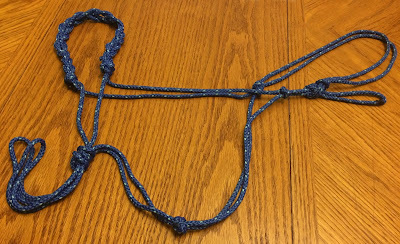 Grab the throat latch and under-nose pieces and tie a knot with a loop hanging from it. 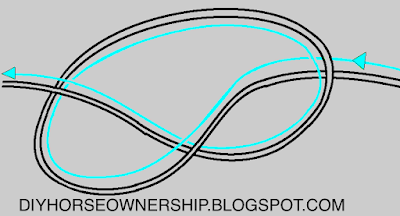 This loop is where you’ll attach your lead rope. 8. At this point, you need to try the halter on your horse. The measurements above are all generic horse sized and won’t work perfectly for every horse. 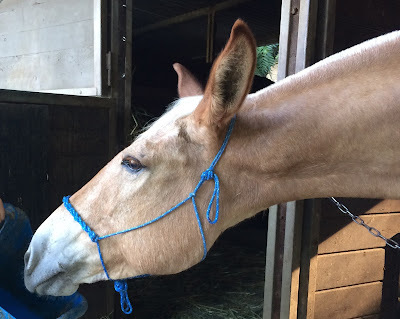 Once it’s on your horse, you can determine what lengths need to change. 10. 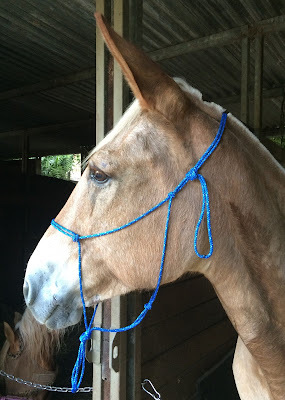 You can add some braiding to the noseband if you want to. Start with 3′ of rope. Find the middle and slip the rope through one of the nose knots. 11. Loop the added rope behind the original over-the-nose pieces. The cross them as you bring them through the middle of the original pieces. At this point, your rope halter is finished. 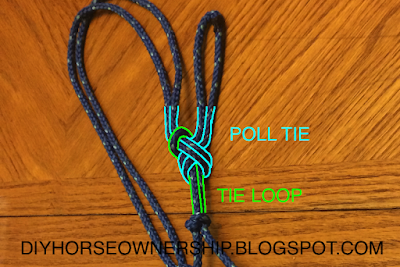 Make sure to tie it correctly when you put it on your horse. 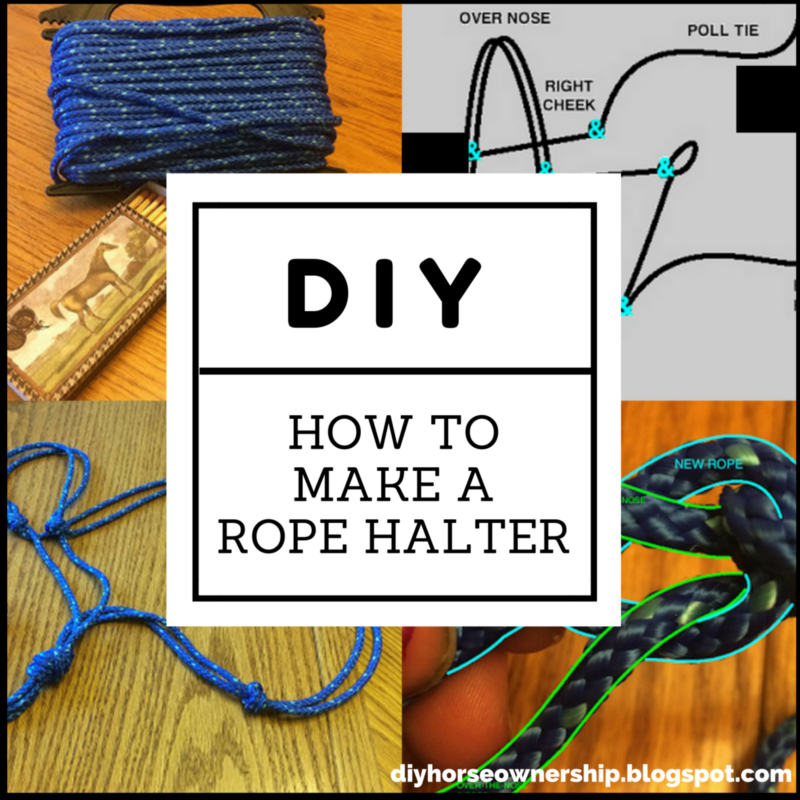 DISCLAIMER: Rope halters can exert a lot more pressure than a normal halter. Do NOT turn a horse out or leave a horse tied with a rope halter. The thinner your rope, the more pressure is exerted. wow. thank you. I will have to try this! Thanks for thinking of me. We actually have this exact thing and it's not helping. I don't blame the product. I just think Nilla is destroying herself despite it.